We had a "White Christmas" in St. George this year. That is something unusual for us. I'm OK with it because it was so fitting for the Christmas Spirit, but I also hope the snow goes away quickly and I can get back to my usual activities in the beautiful desert terrain of Southern Utah such as climbing, mountain biking and hiking. It has been so fun to have my grandaughter, Siena, living with us this year. Having Santa visit and bring her gifts on Christmas morning was fun and brings back good memories of when my daughters were young. Now we have our teenagers and things are quite different (mostly in a good way). Even Eric seems like a teenager even though he is only 11 years old. Having Marty and Becca around influences him and it is hard to keep him young and innocent. Eric and I drove up to Brian Head the day after Christmas and braved the winter storm to get in some fabulous snow boarding in deep powder. It was cold and snowy, but it was worth it to ride the "powder" down the mountain. We got home in time to meet family members arriving for the Larsen Christmas Party. Even with 2 of the brothers not able to attend this year we had a full house. 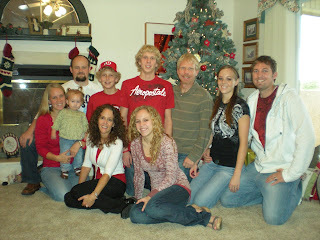 I think the Larsen clan will soon outgrow even our home in St. George. For those of us attending we had a great time. Dinner, a short program, gift opening and games were shared by all. All of Lowell and Marilyn's great grandchildren were present and made lots of noise. (Boden, Jet, and Siena) The newest addition, Elspeth, was adorable. She can be held by anybody and loves to smile and coo with you. I even got in some rock climbing with Ben, CJ and Ty and their boys. Snow Canyon was fun, but surprisingly cold even with the afternoon sun. Nick flew home with his family, Ben drove back home along with Grandma and Grandpa and CJ will soon have to make the long journey back home to Northern Idaho. I got to stay home through it all. I am working the graveyard shift this week in the emergency(which is always a very busy time for us in the emergency department). Well, enough of the rambling for now. Angie said I should post more.....so here it is. December has been mild in Southern Utah this year. Yesterday I did a multiple pitch climb with 2 park rangers on a buttress directly across from the Great White Throne in Zion. Andrew & Derek had climbed the first 4 pitches the previous day "fixing" the first 400 feet with ropes and then descending to rest for the night. I then joined them early the next morning arriving at the base of the cliff just as first light began to break. The name of the climb is "Touchstone" and was first climbed nearly 30 years ago. It is considered a Zion classic and stretches nearly a 1000 feet above the river. It is usually done as a 2 day climb requiring a "bivy" halfway up on one of the ledges. This climb is across the river from Prodigal Son that I climbed last year and slept on the portaledge. Since the rangers had fixed ropes on the first 4 pitches we planned to climb the whole route in a one day push. We took 3 liters of water and a couple of cliff bars between us. We had light jackets and all the standard "trad" climbing gear. Even with a relatively light load, I felt weighted down with gear as we started "jugging" the lines. I was the second to start up. Ascending a rope for 400 feet is a lot of work! I was soon sweating with exertion as I inched higher and higher. 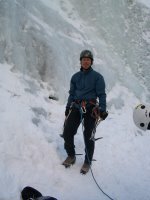 Eventually we all congregated on a small ledge and sorted gear and began to ready ourselves to climb the next 5 pitches to the top. The lower 4 pitches required "aid climbing", but now the crack system began to open up and "free climbing" was now possible although still very difficult. The next 6 1/2 hours was incredible. Free climbing the crack systems proved challenging, exposed and quite strenuous. The higher we climbed the more incredible the view of the Great White Throne. Zion Canyon is also very quiet this time of the year, with very few cars passing below. The sound of the Virgin River dominated the air. We saw some California Condors soaring above and the last fall leaves were still clinging to the cottonwood trees lining the river below. The day was cool but not cold and the sun came out just long enough to warm us up nicely. The last pitch of the day was dicey and exposed. Very exciting! 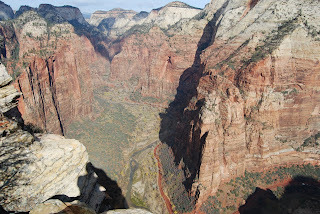 We sat on top of the tower for only a few minutes as the sun began to set behind Angels Landing as we still had to descend back down to the canyon floor. It took us nearly 2 hours and a dozen rappels later to get back down. We coiled up the ropes by headlamp and then hiked back to the truck. What a great way to spend the day! I still made it back to St. George in time to see Rebecca perform in a dance review at the high school. Dinner tasted so good and I fell asleep quickly that night as satisfying exhaustion set in.